MONTGOMERY COUNTY, MD (June 22, 2018) — Brandy Brooks, Democrat for Montgomery County Council At-Large, has earned the endorsement of Maryland State Senator Roger Manno (District 19), People’s Action, and the Progressive Change Campaign Committee. These latest endorsements from local and national progressive leaders demonstrate Brooks’ commitment to building progressive power through community organizing. Brandy Brooks is the most endorsed female candidate running At-Large and would become the first ever Afro-Latina to be elected countywide to the council. The Progressive Change Campaign Committee named Brandy Brooks a 2018 Bold Progressive Champion. The committee recognizes candidates from around the country who are fighting for progressive priorities and looking out for the needs of everyday families. One hundred forty-seven candidates have been named 2018 Champions nationally – including Danielle Meitiv and Chris Wilhelm, fellow candidates in the At-Large field. Earlier this week State Senator Roger Manno endorsed Brandy Brooks at Leisure World via Facebook Live, saying “we have a critical opportunity to elect strong progressive champions at every level of government who will fight for working people.” Brooks also endorsed Manno in the Democratic primary for Maryland’s 6th Congressional District, citing his 12 years of progressive leadership in the General Assembly along with his experience working for three members of Congress. The Primary is June 26. Brandy Brooks is a public election fund candidate for Montgomery County Council At-Large. She is an activist, educator, facilitator, and designer who has spent more than 10 years working on social and environmental justice. Brooks is the Leadership Development Organizer for Progressive Maryland, a statewide nonprofit advocacy organization promoting social, economic, and racial justice. Brandy has been endorsed by 18 local, state, and national groups including unions, progressive grassroots groups, and religious and immigrant advocacy organizations. She is the most endorsed female candidate in the at-large field out of 33 candidates. To learn more about Brandy Brooks, go to www.brandy4montgomery.com. MONTGOMERY COUNTY, MD (June 8, 2018) — Misinformation regarding Brandy Brooks’ publicly available positions on transit are being shared in the Action Committee for Transit (ACT) scorecard. Brooks is setting the record straight to make sure voters across the county have truthful and accurate information to make their decisions. The ACT scorecard claims to be based on several criteria including public statements, answers to questionnaires, and the candidate’s website. The rating does not reflect publicly available information regarding Brandy Brooks’ views on transit or housing. The Brooks campaign has attempted to work with ACT representatives to clarify the misinformation. Representatives from ACT informed the Brooks campaign that her negative score was based on tweets where she emphasized the need for more focus on affordable housing development. They claim that Brooks’ concern about “trickle-down affordability”—the County’s over-reliance on luxury housing developments with a small fraction of affordable units to meet its severe affordable housing deficit—means that she does not support housing development near transit. This is demonstrably false. Brooks has repeatedly stated her commitment to preserving and developing affordable housing near transit nodes, such as the Takoma-Langley Transportation Center that will ultimately become a Purple Line station. Additionally, Brooks has expressed her strong commitment to creating transit solutions for areas of the county that have been overdeveloped without supporting transportation infrastructure, such as Clarksburg and Damascus. The campaign launched the “Correct the Record:ACT Scorecard” information page to provide voters and the media with accurate details on Brandy Brooks’ positions. MONTGOMERY COUNTY, MD (May 11, 2018) — County Council At-Large candidates Brandy Brooks and Chris Wilhelm will launch #TeamProgressive this Saturday, May 12 at the Takoma Park VFW Post 350. The day of action will include volunteer training and a rally, followed by area canvassing by each campaign. #TeamProgressive will hold a series of Backyard Rallies – joint house parties and events throughout Montgomery County – to engage county residents in advance of the early voting period that starts June 14. Brooks, a community organizer with Progressive Maryland, and Wilhelm, an ESOL teacher at Northwood High School, are both candidates using the Public Election Fund program available to Montgomery County candidates. They share a vision for Montgomery County that includes addressing economic inequality, reinvigorating our democracy, fighting structural racism, and reversing environmental degradation. In this unprecedented local election with 33 democrats vying for 4 seats, Brandy Brooks has garnered the support of a diverse coalition of organizations at the local, state and national level – the most organizational endorsements of any female candidate in the race. Brooks and Wilhelm also share nine endorsements from progressive organizations, including MCEA, UFCW Local 1994 MCGEO, Progressive Maryland, Metro DC DSA, National DSA, Progressive Neighbors, the National Nurses Organizing Committee, and Jews United for Justice Campaign Fund. See endorsement list on Brooks’ website. Earlier today the National Nurses Organizing Committee endorsed Brandy Brooks, as well as four other candidates for office in Montgomery County. The National Nurses Organizing Committee is an extension of National Nurses United, the largest union representing registered nurses. National Nurses United are not only national leaders on progressive policy for health care and workers – they’re fighting right here in Montgomery County to ensure that nurses can work in safety and with dignity as they provide the health care our communities need every day. 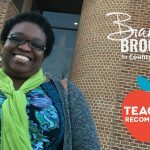 MONTGOMERY COUNTY, MD (April 1, 2018) — Brandy Brooks, at-large candidate for Montgomery County Council, is calling for major changes to the voting process for the at-large race. Her goal is to ensure voters are able to fully evaluate each candidate’s skills, agility under pressure, and creativity, and to allow candidates to clearly distinguish themselves within the crowded field. Brooks challenges the other 37 at-large candidates to a dance off. The format of the dance off will be determined by an independent citizen-led commission that is equally balanced for up-county and down-county, incorporated and unincorporated areas, gender, and dance style preference. The time and place of the dance off is yet to be determined. Now that we’ve got your attention… read Brandy’s Democracy for All platform.